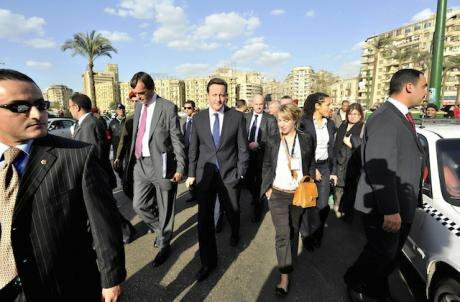 PM David Cameron during a walk through the streets around Tahrir Square in Cairo, Egypt, February 2011. Tim ireland/PA Archive/Press Association. All rights reserved.Findings from the 2014 ArabTrans research in six MENA countries – Egypt, Iraq, Jordan, Libya, Morocco and Tunisia – shed light on what citizens think of the EU and whether its policies address their concerns. The EU recognised at the time of the Arab Uprisings that its policies had failed the people of the region and in 2011 it declared an intent to focus on promoting deep and sustainable democracy and inclusive economic development. However, in practice the EU did not adapt its policy to address popular demands for social justice and economic rights but continued to promote a narrow procedural definition of democracy, to support authoritarian rulers and to implement liberal economic policies that have proved not to support economic development. This inability to address the structural causes of economic and political polarisation pose a serious risk to the Union’s long-term goals in the region. The emerging consensus is that the EU is more interested in stabilising its borderlands… than in democratization. The emerging consensus is that the EU is more interested in stabilising its borderlands and creating a ring of tranquillity around itself to protect its own security, peace and stability than in democratization, the promotion of human rights and inclusive economic development among its southern neighbours. EU policy achievements have been modest, limited to some improvement in economic governance structures in Morocco, some improvement to state structures in Jordan and Palestine and some convergence of energy regulations between the EU and the southern states. It has certainly not achieved its aim of creating a ring of tranquillity and security on its southern borders. It has not been able to prevent the deteriorating security situation in the region, and in 2015 it indicated that security was going to be the main priority in its relations with its southern neighbours over the next few years. Its focus is on controlling the flow of migrants to Europe and the defeat of ‘Islamic State,’ as well as counter-terrorism and counter-radicalisation measures. Meanwhile, our findings suggest that what MENA citizens want is social justice, economic rights, and the eradication of corruption rather than strictly, explicitly or exclusively western-style (neo)liberal democracy. Asked for the countries with which they would like to see their own country form closer relations, respondents rarely nominated the countries of the EU . In response to an open question respondents nominated a total of 58 countries between them, but only seven per cent of respondents nominated an EU member state, with the three most frequently mentioned being Germany (2.5%), France (2.3%) and the UK (1.6%); nine other EU countries were mentioned, by less than one per cent of respondents each. appetite for closer relations with either the EU as a whole or its component parts. Overall, one respondent in three did not think the EU should have any involvement in their country’s policy or did not know in what policy it should be involved, and only 13 per cent said that the most positive thing the Union could do would be to support democratisation (with some variation by country, ranging from four per cent in Egypt to a quarter of one per cent in Iraq). On the other hand, support for economic development, with promoting economic development being the most frequently nominated response in all countries, ranged from 31 per cent in Egypt and Iraq to 64 per cent in Tunisia. Overall, one respondent in three did not think the EU should have any involvement in their country’s policy. The EU is not seen as having had a very positive influence on the development of democracy. This does vary by country, ranging from 47 per cent in Libya to just six per cent in Egypt. The US is viewed in much the same light, suggesting that the lack of support for western powers’ involvement in the promotion of democracy is not specific to the EU. Only 24 per cent evaluated the impact of these programmes positively and exactly the same proportion overall thought their impact had been negative. Libyan respondents were the most positive by a considerable margin, at 35 per cent, and the Egyptians were the least positive (only 3.4%). When asked to name the two most important things the EU could offer to support their country, various kinds of financial support were most frequently mentioned, with 56 per cent of respondents naming support for at least one of ‘basic services’, ‘jobs’, ‘investment’ and/or loans and grants. Given the security situation in 2014 it is not surprising that citizens in Libya and Iraq were more likely to suggest security support. It is interesting to note that ceasing to support Israel was relatively low as a priority, given that nearly three quarters thought Israel had a destabilising effect on the region. This is probably indicative of the priority citizens give to improving their economic situation. It may also be because citizens have given up on the likelihood of the EU and the West more generally actually taking any effective measures to resolve the Palestinian question. There seems to be a considerable disjuncture between the declared intentions behind EU policy and what people in the region see as their priorities This disconnection is likely to be at the root of the poor reputation the EU enjoys amongst regional respondents. The problem lies partly in the goals and instruments of the EU’s policies themselves. The facts that respondents have a generally poor opinion of the EU’s efforts at democracy promotion and that democracy ranks very low among areas on which respondents would like to see the EU focus are not results of a culturally determined or religiously mandated aversion. Rather, they seem to be related on the one hand to a mismatch between the conception of democracy contained in EU documents and the conception of it which the survey data suggest is held by MENA public opinion, and on the other hand to respondents’ socio-political priorities more generally. While the former focuses on formal institutions and processes, for the latter the substantive aspects of democracy – inclusion, social justice, etc. – are also important and cannot be separated from the more formal or procedural considerations. At present its policy of normative leadership is not working: the EU is not recognised as a force impelling the region towards democracy nor even as a force that helps to maintain stability in the region. If the EU wants to increase its influence it must be seen to offer what the people feel they need, and this is not the implementation of electoral procedures. If the EU wants to increase its influence it must be seen to offer what the people feel they need, and this is not the implementation of electoral procedures. Policy will obviously need to be tailored to the needs and views of the receiving country (in the light, probably, of the history of relations with the donor country or countries). But whatever rhetoric of democracy appears in the official documents, the EU might do better in practice to pay less attention to encouraging the use of the systems and mechanisms (which in any case differ from country to country) through which democracy has grown up in European countries and more to supporting or introducing the conditions under which free politics can flourish. These are economic security, inclusive development (making sure all strata benefit from economic improvements), social inclusion (the reconciliation of groups with diverse histories and goals), the rule of law (including its underlying assumptions of fair and equal dealing), political ‘voice’ and the ability to change governments without bloodshed. Not every country which holds formally correct elections can validly claim to foster all of these conditions. See the full briefing in The Arab Transformations Policy Briefs. No.2 from the University of Aberdeen. The research on which the article is based was funded by the European Union under FP7.